Looking for quick easy aprons? This tutorial will show you how to make one in under an hour! Whether you are rushing to make a last-minute DIY gift idea or just want to find easy sewing projects to start out your sewing adventures, this One Hour Free Apron Pattern is going to be a joy to create. This free sewing pattern is reversible, quick, and absolutely adorable. This DIY apron pattern would make a great gift for mom or grandma. You have never seen a sixty-minute make as adorable as this project! Using just half a yard of fabric with an additional quarter yard for the ties, it is budget-friendly, too! Just look out below for the instructions on how to make this adorable and vintage-style waist apron. See below for these free waist apron pattern steps. Cut 2 pieces of fabric 21" wide by 14" long for the main apron 3x ties at 21" wide by 5" long. Cut out your corner template and place it into the bottom right corner of the apron piece, pin and cut around it. Repeat with all remaining bottom corners. Place both apron pieces with right sides together and pin then sew with a 3/8" seam allowance around the perimeter, leaving the straight top edge open. Trim off half of the seam allowance. Turn apron with right sides out and press then top stitch. Leave the top edge open. To make the ties you want to put 2 tie strips with right sides together and pin the left edges together then sew in place. Repeat this with the 3rd tie strap and sew it to the right side. You will now have a continuously long strip. Press the two seam allowances of the tie open. Fold in both short edges 3/8" and press. Fold down both long edges 3/8" and press. Place the apron piece with cut edges into the tie strip so that the apron top edge matches with the tie’s inner folds cut edge. Pin in place every 1–2". Continue pinning the remaining tie folds as well. Sew starting on one of the tie ends and continue on over the apron part until you reach the other tie’s end. Backstitch the beginning and ends. 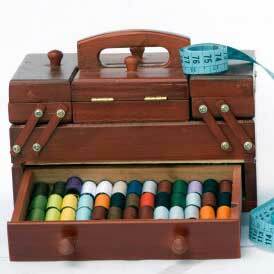 Check out even more sewing project ideas in our half yard sewing project ideas tag pages. Who are you going to make this apron for? This is a very easy pattern that would make a very nice gift for almost any occasion, including birthdays, holidays or even a nice hostess gift. The simple look of the apron could be embellished to make it more individual with pockets, ruffles, lace, rickrack and fun fabric. You could customize each apron with fun fabric and make quite a splash when giving a gift!